Available in a range of protection levels, sizes and shapes: all providing total and ultra-reliable coverage. Cleanroom Masks — KIMTECH PURE* Masks for the ultimate comfort with excellent filtration efficiency to avoid contamination in ISO 3 or higher cleanrooms. Cleanroom Veils — KIMTECH PURE* Veils for the ultimate comfort with excellent filtration efficiency to avoid contamination in ISO 3 or higher cleanrooms. 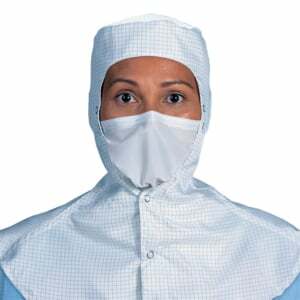 Lab masks — Kimberly-Clark* Masks give total vital low lint protection and the comfort required for critical tasks in laboratories. KIMTECH PURE* Sterile Masks — offering complete comfort with excellent filtration efficiency to avoid contamination in aseptic environments.